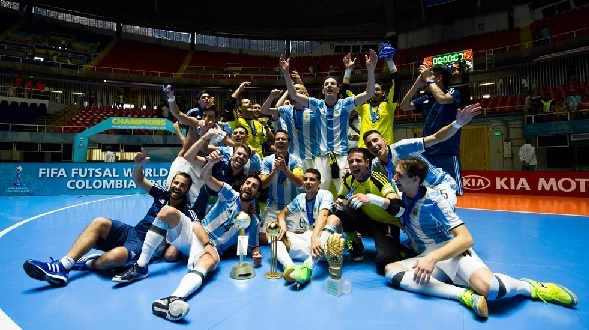 This week coming out of Argentina through Pasion Futsal is that Argentina has confirmed that they are playing friendly futsal tournaments in the United States, Los Angeles, prior to the Copa America in Chile (October 21 to 28). Then they will be going to Saudi Arabia, from December 1 to 4 against their hosts, Italy and Paraguay. The Argentine National Team is preparing for the qualifiers at the beginning of next year, with a view to the Lithuanian World Cup in 2020. For this, the team led by Matías Lucuix will have several futsal tournaments this year, in which they will use the FIFA dates to call those up who play in Europe. This will start from April 14 to 16 in Italy in the city of Pescara where they will face their hosts and Bosnia & Herzegovina then there will be a series of two friendlies against France at the end of May and the beginning of June. The aim is for the tournament to be in the city of Los Angeles against the U.S and Brazil with September being looked at. Then it will be the turn of the Futsal Copa America in Chile, from October 21 to 28. At the end of the year, prior to the Qualifying Games, from December 1 to 4, the Argentinian National Futsal Team will travel to Saudi Arabia to play a home game against their hosts, Italy and Paraguay. It only remains to known, if this year, there will be an edition of the South American League.